On Wednesday, March 13 at the closing session of the 2019 SC Nonprofit Summit, Nicole Echols of Harvest Hope Food Bank received the Fred R. Sheheen Award for Excellence in Nonprofit Leadership. The award recognizes individuals who have utilized organizational and resource development to effectively manage a nonprofit group. It is sponsored by the Fred Sheheen Non-Profit Leadership Institute at Francis Marion University. Echols is the 12th recipient of the award. 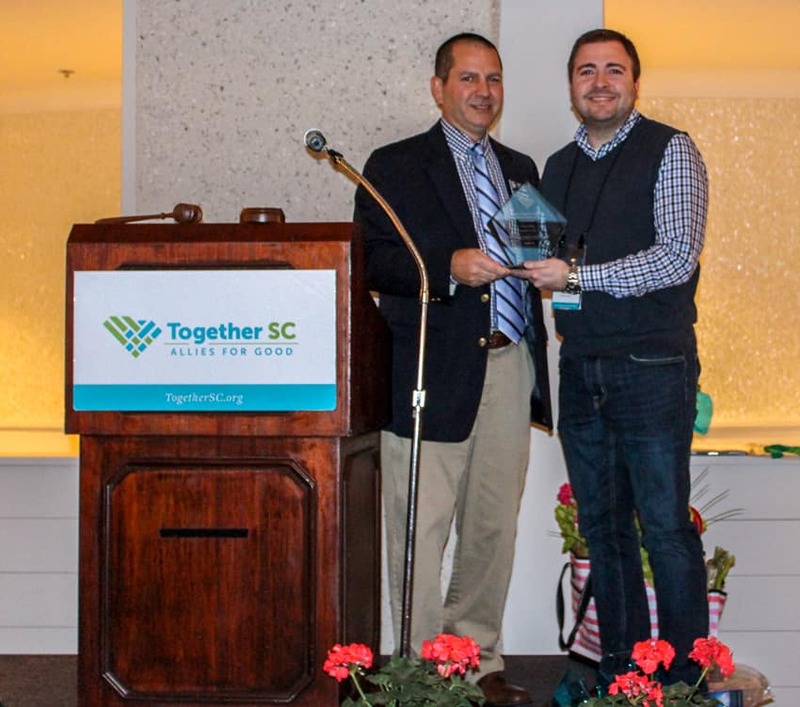 Francis Marion University’s Fred R. Sheheen Non-Profit Leadership Institute and Together SC honored an upstate businessman with their highest award on March 6 at the 2018 Together SC’s Nonprofit Summit in Hilton Head Island, S.C.
Chris Manley president, executive director and founder of Rebuild Upstate, was presented the Fred R. Sheheen Award for Excellence in Non-Profit Leadership. The award, named in memory of the late Fred R. Sheheen, the founding director of the Non-Profit Leadership Institute, is presented annually to a graduate of FMU’s Non-Profit Leadership Institute or a member of Together SC (formerly SCANPO) who has excelled in the management of their establishment through organization and resource development. Manley’s Rebuild Upstate is a nonprofit organization that is focused on performing repairs to substandard housing occupied by children, the elderly and those with disabilities. Rebuild Upstate’s goal is to ensure their clients are able to remain in their own homes, free from unsafe conditions. John Boyanoski, a member of the Rebuild Upstate Board of Directors, says Manley’s work has been immeasurably beneficial to not just the recipients of Rebuild Upstate’s generosity, but the entire Upstate region. Manley was presented with a not just the Fred R. Sheheen Award for Excellence in Non-Profit Leadership, but a $500 award, recognition through various communications across the state. In 2017, the Award for Nonprofit Leadership was named in the memory of Fred Sheheen, founder of the Non-Profit Leadership Institute at Francis Marin University. The purpose of the leadership award is to recognize a graduate of Fred R. Sheheen Non-Profit Leadership Institute at Francis Marion University or a Together SC member who has excelled in the management of their organization through organizational and resource development. This award is sponsored by the Fred R. Sheheen Non-Profit Leadership Institute at Francis Marion University. $500 cash award given by Francis Marion University. The 2018 Fred R. Sheheen Award for Excellence in Non-Profit Leadership will be presented in Hilton Head at the 2018 SC Nonprofit Summit. Apply for the 2018 Fred R. Sheheen Award for Excellence in Nonprofit Leadership today! For questions about nominations, please contact Cheri Richardson with the Francis Marion University Education Foundation office by emailing crichardson@fmarion.edu or calling 843-661-1199. Make an old idea new again! That's just what Together SC did when it (re)created its “Plenty in 20” webinars designed to complement its Carolina Leadership Seminars. There is a nominal cost to attend the “Plenty in 20” webinars and members of Together SC receive a discount on registration. "Plenty in 20" is a nice strategy for engaging members, expanding a state association's outreach, attracting new members, and building capacity. Sounds like 20 minutes well spent. After 20 years, the South Carolina Association of Nonprofit Organizations felt it was time to rebrand itself. With a vision to “reinvent” its identity that would encapsulate everything the organization does, SCANPO set out to completely change how it looks, talks, and behaves to become Together SC. Thank you to Madeleine McGee (President) and Ben Bullock (Director of Operations) of Together SC, and Jessica Munday of TRIO Solutions, for sharing their time and insights with the network. When I was five or six, a childhood friend had her birthday party on Mr. Knozit’s television show. The jovial host, who became an institution in South Carolina educational programming, had a favorite question, and I couldn’t WAIT to answer it. “What will YOU do when you grow up?” he asked. I piped up with unbridled enthusiasm: “A cheerleader for the Carolina Game-cops [sic]!” Obviously. It didn’t take long into my adolescence for me to realize that I didn’t quite have the chops for professional cheerleading. But it was also during those formative years that I was watching my dad build a local cable company and my mom build a retail company that helped artisans in Mexico. I was a lucky kid. Though I didn’t think much of it at the time, it was undoubtedly my exposure to their non-traditional, entrepreneurial paths that gave me the courage to pursue a unique career in public service. A young person’s imagination is a powerful thing; but I daresay it is—often to our collective detriment—limited by what we know: the people, jobs, lifestyles, and communities we’re exposed to in our formative years. That’s why SC Future Minds is proud to partner with LeadershipSC on a new online platform, Inspire A Career. We want to expose South Carolina’s students, many of whom live in isolated communities, to what they may not know—the expansive universe of job opportunities that await them around our state. The website, developed by LeadershipSC and hosted by SC Future Minds, serves as a matchmaking service for South Carolina professionals and public schools whose students will benefit from learning about different career paths. Through a simple online registration process, we will connect professionals in our database to schools and classrooms for career days or other job-oriented events. But the platform can’t work without you! We need professionals from all industries and backgrounds to offer their stories and adventures with classrooms around the state. The process takes three minutes, and you can even indicate how far (or short) you’re willing to travel. I encourage you to sign up today, and, like Mr. Knozit and my parents, help stoke the imagination and ambition of our future workforce. You, too, can Inspire A Career. Caroline Mauldin is the Executive Director of SC Future Minds, a statewide nonprofit connecting private resources to public education as a cornerstone of social and economic progress in South Carolina. Learn more about their work at scfutureminds.org.